Yesterday I turned twenty-nine. I’ve been thinking about this birthday a lot, and trying to come to terms with where I am in my life right now, versus where I might have loosely imagined I’d be when I turned twenty. I remember feeling anxious about twenty. I had just decided not to become a doctor, and so many things were unknown. It was exciting, but scary, too. And twenty, well, twenty marked the beginning of what then seemed like the decade that would determine so much of what my life would be: graduation, the start of a career, a family? The idea that this would be the decade for all of those things weighed heavily on me. And now? Well, I have to admit, I thought I was beyond thinking about these kinds of expectations for myself, but this birthday has brought a lot of those thoughts back. Intellectually, I am quite comfortable saying out loud that I am happy with the decisions I’ve made, and the unexpected places they’ve taken me. Emotionally, though, I think it is okay to acknowledge that maybe I’m not where I thought I’d be at twenty-nine, at least in the non-academic parts of my life, and that I’m a little bit sad about that. And that’s okay. I no longer feel like my twenties will determine my future, and I have a much stronger sense of myself than I did at twenty. 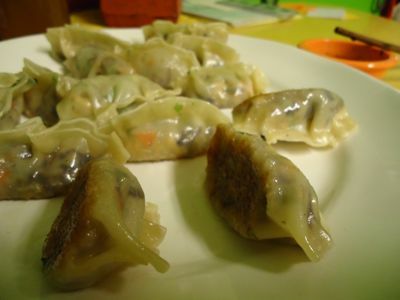 So Boh and I celebrated quietly yesterday, with an extra-long frolic in the snow, and dumplings. This is the kind of meal I rarely prepare for myself — it is a lot of work for just me. But yesterday, I decided that I would give myself extra time in the kitchen, instead of putting something to simmer on the stove so that I could continue to read. (And I’ve got leftovers for tonight.) I’m sure I’ll do some celebrating with friends this weekend, but yesterday was what I needed. 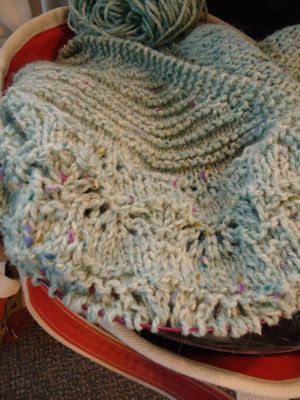 I crossed some things off of my to-do list, indulged a bit in the kitchen and outside, and knit a few more rows on my terra shawl.